Only a few short years ago, the idea of a human thief teaming up with a green-skinned assassin, a bad-tempered alien warrior with a murderous agenda, a walking tree with a small vocabulary and a talking raccoon who also happens to be a strategic genius to take down a villainous blue terrorist—in space—would not only be considered as preposterous as this sentence’s structure, but also laughably unfit for the big Hollywood screen. But today’s world is one of epic cinematic possibility, allowing films like Guardians of the Galaxy to light up screens around the world with dazzling visual effects and make millions along the way. Released on Aug. 1, the latest entry into Marvel Studio’s cinematic superhero world introduces audiences to an entirely new cast of otherworldly characters, not unlike the now-familiar Avengers but decidedly closer to the wrong side of the law. Comedy and adventure naturally ensues. The film follows Peter “Starlord” Quill (Chris Pratt, Parks and Recreation), a human taken from Earth as a child and raised as a bandit amongst intergalactic alien mercenaries. After he inadvertently steals a potentially world-ending artifact, Quill finds himself in the middle of a conflict between Ronan (Lee Pace, the Hobbit trilogy), a powerful maniac intent on global genocide, and the peaceful citizens of the galaxy. After a series of events lands him in prison, Quill teams up with the mysterious Gamora (Zoe Saldana, Star Trek), a skilled fighter with connections to the enemy, and Drax (Dave Batista, Riddick), a violent and muscled alien with a personal vendetta against Ronan. Also joining them are Groot, a giant, walking, tree-like alien with a peaceful demeanor, and his bounty hunter partner Rocket, a raccoon who has been genetically manipulated to talk like a human and think like a battle tactician (voiced by Vin Diesel, the Fast and the Furious series, and Bradley Cooper, The Hangover, respectively). Together, this band of unlikely companions must move past their own differences, both in species and personality, in order to defeat the genocidal threat of Ronan and earn their place as the titular guardians of the galaxy. At its heart, Guardians is undoubtedly Marvel’s most kid-friendly spectacle; complete with talking animals, shining spaceship battles and the best soundtrack on a Hollywood film since Space Jam’s dropped the beat on the world in 1996. Additionally, the visuals are, in a word, impressive; every scene in the film seems to contain the entire spectrum of visible color, without threatening to overwhelm the viewer with an explosion of blinding highlights. 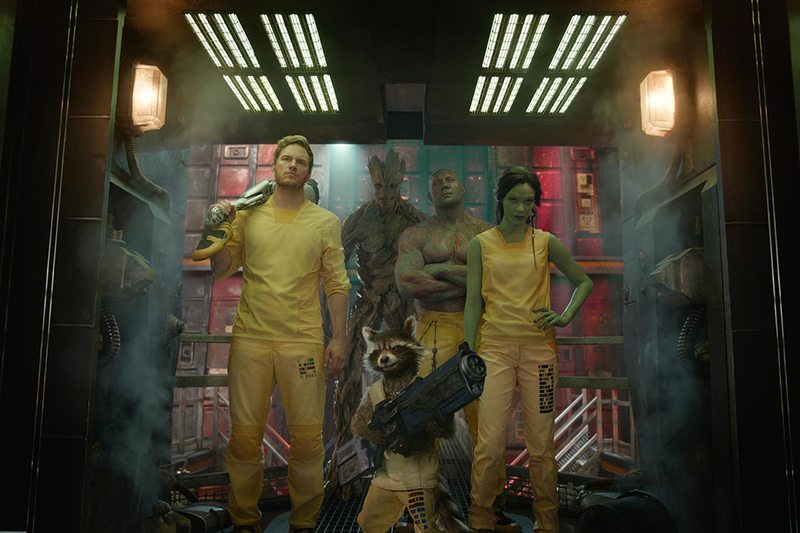 Guardians’ source material stems from the seemingly boundless world of comics, and the film’s creators take full advantage of this lack of reality-imposed boundaries; the film’s outer space landscape varies between the visual mastery of Gravity and the almost cheesy otherworld-ness of Thor, and constantly tops itself in terms of ingenuity and just plain wackiness. However, despite its high-quality visual effects, the film could not have become the critical and financial success that it is without the chemistry evident among its cast members, both leading and supporting. Although Pratt has been known mostly for his supporting roles in the past, the actor’s introduction into the center of the blockbuster spotlight is a successful one. In a nutshell, Pratt’s Quill is Iron Man without the destructive health problems: a natural born leader and womanizer who can crack a joke as easily as he can pilot his ship through an oncoming barrage of galactic enemies. In accordance with the more lighthearted tone of the film, Pratt shines the brightest during his more comedic moments, of which there are many. At his side, Saldana and Batista do the same, albeit in a more reserved sense, while Diesel and Cooper need only their voices to make the pairing of Groot and Rocket one of the more memorable and hilarious in recent history. And that’s just the main cast. Veteran actors such as Glenn Close (Damages) and Benicio del Toro (Traffic) are counted among the film’s supporting lineup, resulting an array of performances, both dramatic and comedic, that manages to do the impossible in overshadowing the film’s stunning visuals. Overall, Guardians has provided the Marvel Cinematic Universe with a brighter, funnier and slightly more innocent facade, made even more prominent in the wake of more brooding films like Captain America: The Winter Solder and Thor: The Dark World. This contrast between the lighthearted and the ominous poses some interesting questions for the future of the superhero franchise. Although Guardians did not contain direct connections to any of the other Marvel films aside from a few supporting characters and locations, the film itself takes place within the same cinematic world as 2012’s The Avengers, meaning that audiences may soon be paying to see Quill and the gang team up with Iron Man, the Hulk and the rest of Earth’s mightiest heroes. Beginning with Avengers: Age of Ultron in May 2015, Marvel seems to be entering a brave new world of superhero cinema, one in which entire galaxies may come head to head and the characters that audiences have come to love will get to interact in ways only seen in the comics themselves until now. Already, Marvel has granted Guardians a sequel, along with a third installment in the Captain America franchise and a debut film for Ant-Man, a popular comic book star who has yet to be seen in any film installment to date. It remains to be seen if these bold new steps into previously uncharted superhero territory may prove to be too confusing or implausible to Marvel’s loyal fan base, but as it stands, with Guardians of the Galaxy currently dominating the global cinematic scene, the studio has never been stronger.